Why are the ads so loud? Hi, i'm using deezer free version, and listening to the music at a low volume. Why the voice telling me to sign for the premium account has to be at MAXIMUM VOLUME ??? I'm Not happy as a customer. Normalise did not work. Still superloud ads. I have the volume as low as possible. 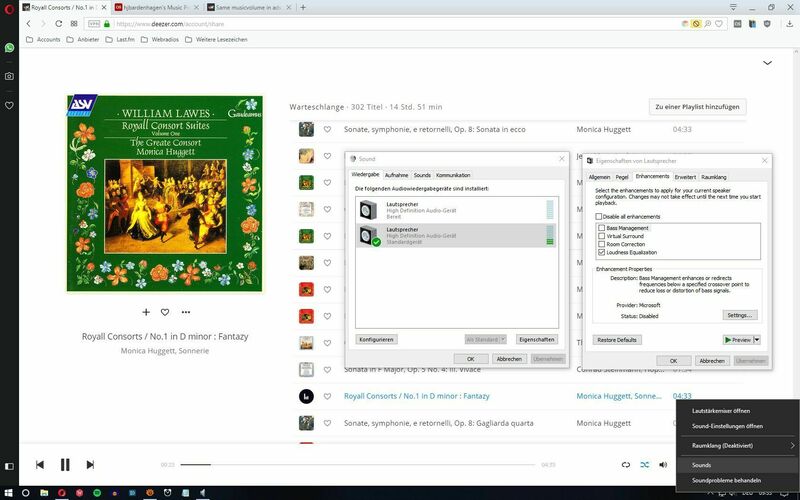 Right-click on the speaker icon in the Windows systray on the right side of the task bar, then on Sounds in the grey popup menu, choose your active speaker and its properties in the next window, then the Enhancements tab and enable Loudness Equalization there. This will of course normalize all sounds from your computer, e.g. loud movies as well. As you can see in the screenshot I'm listening to baroque music at the moment which usually has a soft volume, but the Deezer ads are not louder than the music with this setting. Same is true for Spotify, and I usually prefer this behaviour for normal listening. When I want to hear the original dynamic changes in the music e.g. for listening tests, I disable it. 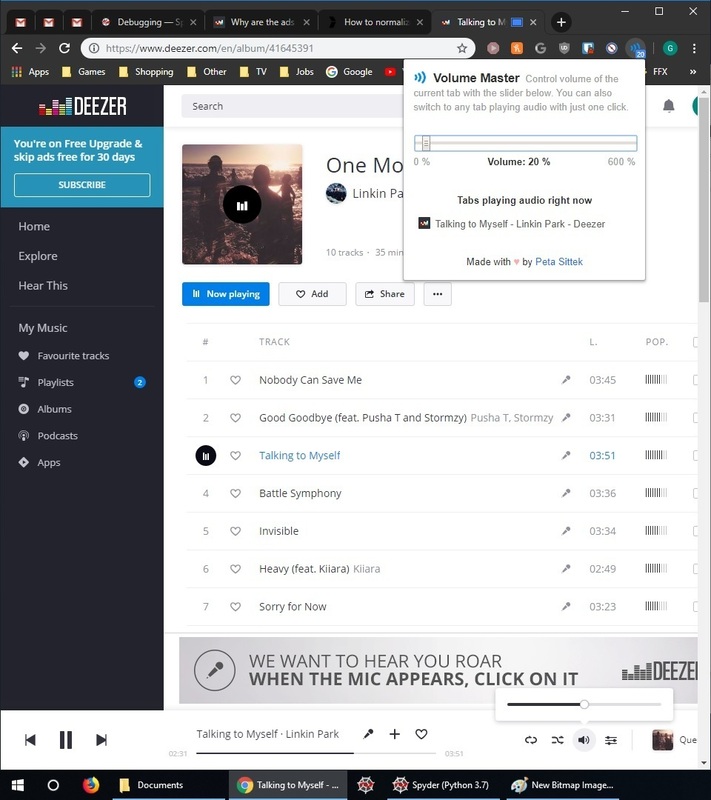 Please fix the volume issue of your ads (South African Deezer user). Not only is it annoying, it is painful. There is also the possibility of serious damage to your ears especially to younger children. I would hate to see Deezer having a lawsuit on their hands for not fixing the issue. Thanks, we will keep passing the feedback on to the right team! Thanks! I see there have been comments going back a year or more on this. Deezer, can you sort this out? I listen at low volume in the office sometimes and when any advert comes on it plays at above maximum volume. I can't get the music to play as loud as the adverts, I've tried. I had a Deezer subscription which I cancelled recently for financial reasons. I have now stopped using Deezer, since the adverts that you play are 500% louder than the music. You have rendered it unusable for me now, listening to music, the advert comes on and it's just so loud it needs to be turned down. Then the music is too low to listen to. A great shame that you have decided to do this. I planned to stay with the free until I could afford to once more subscribe, but now I have moved to Spotify. For those using Chrome on PC, installing the extension 'Volume Master' worked for me. This extension allows you to separately control the volume for each tab on chrome. Then, leave the Deezer volume at default, and just use the extension to adjust the volume. I have it at 20% and is working great. No need to mess with the main pc volume and the volume knob on the speakers. The volume of your ads is not at the same level as the previous song. It is very loud, and surprises/scares and makes no sense. Please analyse the volume of the previous song and play the ad at the same volume level. Turn the computer volume down and the app volume up. Having used other music streaming services for years I enjoy the selection on Deezer. I listen to music while I work on my websites. What I can't stand is that the volume of commercials is twice what I'm listening to and it blasts me out of my seat. I have reported this to Deezer numerous times but they don't seem to be at all concerned so I'll be going back to other music streaming services. Sorry to hear that. Have you tried the workaround above? On the contrary, the mute button is pretty handy. Fix it! Some countries (France included) have laws about ads volume on radio and TV to prevent this kind of practices. Damn. Why is the Ad so loud? Please. I almost lost my ears. I'm sorry for that! Please see above for further info.